Councillors are set to ask questions on Metro line closures next week as works progress on a new £21m transport interchange for South Shields. Train travellers will face up to 10 months of disruption as part of the development, with phase one of the works starting next month. 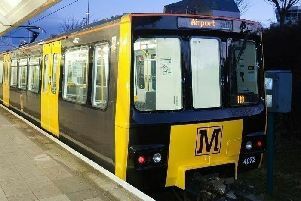 Nexus, the public body which owns and manages the Tyne and Wear Metro, will carry out track and signalling updates so that trains can serve the interchange when it opens in 2019. The first phase of works – between Monday, October 1 and Saturday, November 3 – will see the line between South Shields and Chichester close for five weeks in both directions. During this time, the ‘900’ replacement bus service will be provided, with normal rail services between Chichester and Newcastle remaining unaffected. At next week’s Riverside Community Area Forum (CAF), councillors and the public will be able to ask questions on the scheme. “We’re pleased to welcome a representative from Nexus to our next meeting, who will talk us through alternative arrangements and will be able to answer any questions,” she said. The next stage of works, from Sunday November 4, will also see trains unable to use platform two at Chichester station until August next year. Passengers heading towards Newcastle are urged to travel to South Shields on platform one and stay on the service on its return journey. Travellers going from South Shields to Chichester are advised to remain on the train until Tyne Dock before returning to platform one at Chichester. The CAF will take place on Tuesday, September 18 at South Shields Town Hall with the meeting kicking off a 10am.